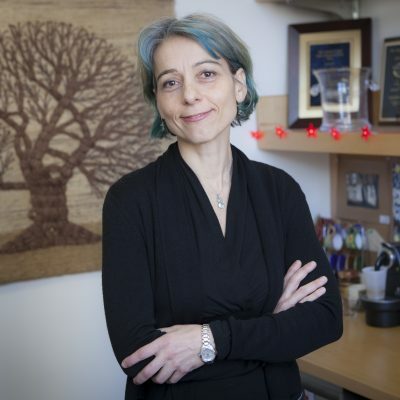 Valentina Greco is an Associate Professor in the Departments of Genetics, Cell Biology and Dermatology at Yale University, and is a member of the Yale School of Medicine Stem Cell Center and Cancer Center. The Greco lab is shedding new light on the mysterious lives of stem cells. Using stunning in vivo imaging of intact tissues, they reveal how stem cells are regulated and deployed during normal tissue maintenance and in tissue repair. Recently, the Greco lab has characterized how stem cells in the mouse epidermis participate in injury repair through collective migration and proliferation (Park et al., Nature Cell Biology, 2017). They also discovered that normal mouse epidermal cells can resolve tumor-like growths, correcting significant defects in tissue architecture (Brown and Pineda et al., Nature, 2017). 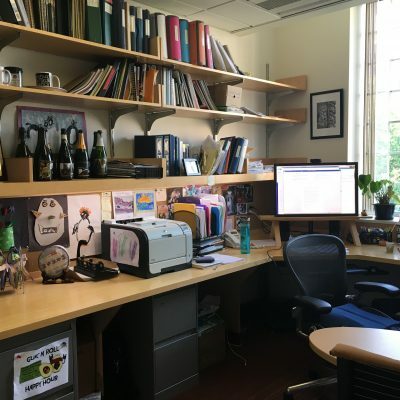 Throughout her career, Greco has received many awards, including an HHMI Faculty Scholar Award and an Early Career Award from the American Society of Cell Biology. We are fascinated by how different cell behaviors are coordinated to maintain tissue function under homeostatic conditions, as well as how they are altered to adapt to challenges like injury and cancer. To this end, we have established an approach to visualize and manipulate stem cells and their niche in the skin of an intact, uninjured mouse. 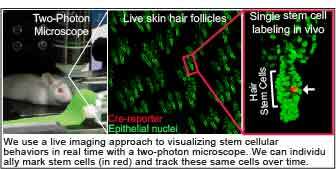 Our real-time in vivo imaging of skin epithelium has allowed us to capture a number of basic principles of regeneration, including that location dictates stem cell fate, that specialized stem cells are dispensable for tissue growth while the niche is required, and that tissue correction preserves homeostasis. What is one word that best describes how you work: Fully. When I commit to something, I give everything I have to shape/turn that commitment (mentee/colleague relationships, projects, teaching, etc.) into a meaningful and rewarding life experience. The potential for unexpected discovery, as well as the opportunity to work closely with people who share the same passion I feel for this work. A moment when I gained clarity about my passion for science was during my PhD selection at EMBL (The European Molecular Biology Laboratory) in 1998. When I was exposed to the amazing science each PI discussed with me during my interview, I felt hooked and deeply thirsty for learning more. I specifically remember Michael Way showing a movie of how listeria infect cells and the strong excitement I felt in being able to visualize what happens inside our bodies and cells. What is one part of your current position or project that you find challenging? Making sure our research is conducted thoughtfully and takes into account points of view of all scientists involved, be it my own mentees or colleagues, who share the same scientific interest. We operate often within time constraints (in talks) or word limits (in papers) and being able to properly reference all the work already done and even ongoing in a given scientific area is challenging. 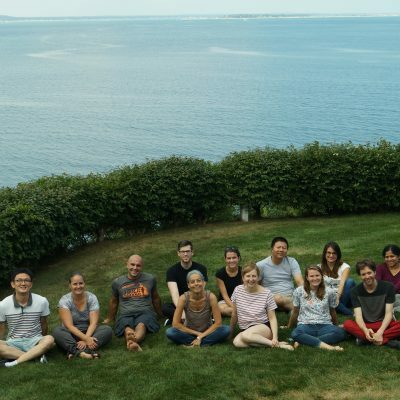 Invest in your lab members and be passionate about helping them develop into independent, well-nourished scientists from the start. It may seem counterintuitive, but thinking, not action, has been my shortcut. It has helped me to recognize the time that tasks actually need in advance, and prepare for them by even adding extra time to dedicate to it as a buffer. Thinking also helps me to know myself more deeply. Rather than avoiding or being ashamed of my weaknesses, I address them by reaching out to my group so that together we are more effective and also satisfied. My espresso machine – it was the first piece of equipment that entered my office when I started eight years ago. It still works! Check in with people I have an investment in, from my friends and family to my mentees and cherished colleagues. I have many heroes, a list too long to add to this paragraph, that I have accumulated over the years, and they range from very young students to senior scientists who still foster a thirst or student-like attitude to learning. In reflecting what I admire in them is their recognition and acknowledgment of teamwork. I believe that as a society, we see heroes as individuals who are extremely bright and special, but who go solo and owe little to the majority of people around them. I believe we also perceive dependence on teamwork as a vulnerability instead of an enhancement of any single individual capacity to reach a goal. Thus, the quality I admire in my scientific heroes is the genuine recognition of their dependence on their team members as well as their projected perception that their incredible discoveries and (scientific) accomplishments are the result of an interdependent community. I think a lot about biases and how they can affect my thinking and behaviors. I also love playing or listening to music and have Pandora to inform me of new bands/songs. Being both an immigrant and a woman I tend to think a lot about diversity. It has been my experience, especially in work settings, that my thinking has been at times different from others which has caused me to reflect on what it means to be different and for anybody in that position, how to be listened to and appreciated. I used to be a late person but for several years I have discovered the pleasure of waking up early (having kids encouraged this change! )—when it is quiet—and I can think clearly with music while drinking an espresso. Be in charge no matter how young you may be and actively seek supportive criticism. It stings badly—but it can accelerate one’s growth considerably.